Precise numbers vary, but there are estimated to be around seven thousand languages in the world. Whether it’s your first, second or tenth foreign tongue, you are faced with the same fundamental question—which language should I learn next? The answer to the question will of course be different depending on your circumstances. If you live in the Philippines and want to make yourself more employable your best foreign language to learn will be different than if you have a fiancé in Brazil. To estimate your potential return on investment in language learning, you must therefore first understand your learning goals and motivations. Once you have clarified your objectives, read through the list below for some pointers on how to choose the best language to achieve your goals. An intuitive way of choosing which languages you should learn is to consider the number of speakers they will allow you to communicate with. That looks like a sensible list, but it fails to account for bilingual minorities, countries with several official languages and foreign language education in schools around the world. For example, nearly half of Arabic and Russian speakers don't use the languages as their mother tongues. Let's add second language speakers. This list is more useful, but still far from a definitive answer. First, it's likely to change in the future. 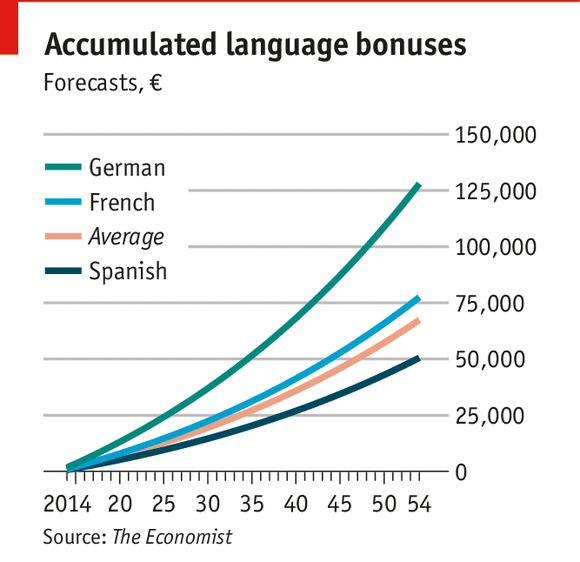 Indeed, French is predicted to become the most spoken language in the world, above English and Mandarin, by 2050. Second, what do you care about 250 million Portuguese speakers if you never visit Portugal or Brazil? In other words, from the perspective of a learner, not all speakers are created alike. You must look at the list above through the lens of your location and future plans, which is where following sections should help you. Globalization has made all businesses international to some extent, and employers will love to see a foreign language on your CV. As growing businesses expand beyond their national borders, knowing a second language can also fast-track you to promotion or even a generous expat package. Let's start by looking at languages employers in English-speaking countries regard as the biggest assets to your CV. Of course, if you are not desperate for any job, the accumulated bonuses and median salary by language should also be of high interest. But, learning a natural language is a big undertaking, and if you job search starts in the coming months, you're unlikely to reach a level employers would find useful by then. In that case, any language may be better than none, and the next section is for you! The benefits of learning a foreign language are far ranging, and go beyond the monetary. Bilinguals process information faster, develop Alzheimer's later, and tend to be more sensitive in multicultural setting—our habitat in this day and age. If you just need a conversation starter, or if you made a bet that you will learn a language in a set amount of time, you could go as simple as Toki Pona, which you can learn in under 8 hours! You might never get to speak it in the real world, but understanding the meaning of life in 120 words is valuable in its own. If you're on the lookout for a language that is quick to learn, but also useful and interesting, take a good at Malay. As an Asian language, it might sound exotic, but it is in fact one of the world's easier languages to master! Malay uses the Latin alphabet, the pronunciation can be picked up in no time, and its grammar is straightforward with no conjugation, plural or tenses. Better yet, it is spoken by over 270 million people across Southeast Asia! Another option is Afrikaans, the language of South Africa with easy pronunciation, no conjugation, and a wealth of shared vocabulary with English. With some twenty million speakers, it is nothing to be frowned on, and you can always use it as a gateway to learning Dutch—its parent language. Whichever language you pick, remember that motivation, focus, and the right language learning habits have a much higher impact on your progress than difference in vocabulary or grammar. Also, if you're thinking of learning a more unusual tongue, keep in mind that the language learning resources available may not be the same. While it can be tempting to learn Africa's Hausa, it will be harder to find a good textbook or tutor than it would be for, let’s say, Italian. If you're more entrepreneurial and tempted to tap opportunities in developing countries on your own, the languages you'll find useful are quite different from what an employer at home may value. You should consider languages spoken in countries with high growth and low competition, and in which communication problems are one of the highest barriers to entry. Less than 10% of Russia's population speaks decent English, and even if you don't believe in BRICS with all that's happening in the world today, the language is equally useful across Eastern Europe and most of Central Asia. It'll even help you get around Mongolia, which uses the Cyrillic script to write their tongue. Spanish is the easiest language of the developing world, useful if you're looking to live or do business in the growing Latin world. Both South and Central America offer great, affordable expat living, Paraguay and Ecuador provide cheap agricultural land for business and self-reliant lifestyle, and as countries like Cuba and Venezuela open up, Spanish will only grow more useful for working with rising nations. Arabic is the primary language language of an insular but increasingly important market of the Middle East and North Africa, ranging from highly developed Tunisia and United Arab Emirates, to ultra-frontier states like Iraq and Yemen. Learning the Arabic alphabet will also give you a head start on Farsi, the language of Iran, a country with close to 80 million people, slowly opening up to the outside world. Finally, even though China is now one of the world's dominant economies, less than 1% of its population speak English, and many regions outside coastal areas remain untouched by multinational business. Chinese influence has also expanded into Africa and Central Asia, providing further opportunities to use Mandarin Chinese for social good and profit. Learn about success in business from the top self-made businessman Richard Branson. Whereas in business, languages remain an optional advantage, they can be a minimum requirement if you want to volunteer abroad, join an intelligence agency, serve on a diplomatic mission, or cooperate with the UN and OSCE. Which language should you study if international relations or public service is your calling? The United Nations is one of the world’s largest employers of language professionals, and all delegates and personnel are expected to know at least one, and ideally several of the six official and working languages of the UN: Arabic, Chinese, English, French, Russian, Spanish. These are also the official languages of most other international organizations, such as the International Criminal Court (ICC) and the World Bank (WB), with the addition of Japanese in case of the International Monetary Fund (IMF). The CIA is actively recruiting bilinguals, and aims to double its multilingual workforce in five years through monetary incentives and language achievement awards (new employees can qualify for a hiring bonus of up to $35,000!). As part of the initiative, the agency announced eleven mission-critical languages that will be the focus of their recruitement efforts. Similarly, MI6 (Britain's Secret Intelligence Service) is seeking language specialists fluent in Russian, Arabic and Mandarin as their top priority. You may be one of those people for whom qualities like cultural intelligence, resume padding and market access come only secondary in language learning. What you seek is uniqueness of grammar, mystery of sounds and the most mind-boggling syntax. 95% of the world’s population speaks 5% of the world’s languages, so your choice here is extensive. How about Inuktitut? This Eskimo-Aleut language is agglutinative, ergative-absolutive and one of its writing systems is based on glyphs. To give you a head start, here is the word for Saturday: Naattingujalaarniaq. Your needs as a young sudent or a middle-aged professional can be quite different from when you retire. The good news? Retirement comes with the flexibility to move abroad, possibly for the first time in your life! Mixing data on everything from weather to retiree discounts with reports from its global network of correspondents, International Living, a media company specializing in retirement abroad, compiles an annual list of the best countries for North American retirees. What's great about this list is that even though it spans the globe, only four foreign languages are enough to get around all of them. Better yet, three of them, Malay, Spanish and Portuguese, are very easy to learn for an English speaker. So far, we've mostly considered very practical reasons for learning this or other language, but many students choose a language with their heart, attracted by a particular country and its culture. If you haven't traveled around the world, it can be nevertheless be difficult to make a choice, even if your interests are romantic or intellectual. For what it's worth, my vote goes to French, a language that gives you access to some of the greatest thinkers in the world, many of the best regarded filmographers, and world-class music no matter your favourite genre. I see you're ready to learn! Why not download my free self-learning language checklist?